HOW MANY DISCOVERY OWNERS ARE FED UP WITH THEIR ‘LOW-MOUNT’ TOW HITCH? Some have said that the OE Discovery 3 tow hitch system was designed and manufactured by school boys or perhaps work experience engineers at best – it’s that bad! When fitted, it hangs down far too low, doubling as a plough…great if you’re a farmer trying to multiuse every implement. When fitted, you can’t remove the spare wheel…not great when you’ve got a trailer of van hitched up and get a flat tyre on your D3. When fitted, it’s impractically low to tow most caravans and off road trailers on a level stance…great for those that tow low, low trailers – not many of us. When fitted, it retards departure angles, effectively limiting 4WDing to the flats…great for…pretty much nothing really! We take it the aforementioned school boy or wanna-be engineer didn't win any design awards with this one, so why did it ever go into production? Andrew Trafford, a knower of most things Land Rover and a qualified building designer, quietly walked into Mitchell Brothers 4x4 in Sydney’s north, told them of the problems with the OE D3 tow hitch, showed them some of the half-baked overseas fixes and proclaimed that customers would come in droves if they could get their hands on an improved hitch. Not one to shy away from a challenge, Aaron Mitchell listened intently to Andrews ideas, threw a few suggestions to engineers, took note of what customers were saying and expecting and would have jumped into the deep end with CAD draftsmen and designers… if it weren't for the high prices he was being quoted for the respective professionals services. Instead, he shelled out for the CAD packages and set about learning to draw via his computer, rather than his accustomed pencil and paper efforts. Over time he came up with plans to show to engineers, laser cutters and Australian authorities for formal presentation and passing of ADR’s. With very few changes, the new D3 hitch was given the thumbs up with approvals of ADR 62/01 and AS4177.1-2004 – a great milestone for the Mitchell Brothers. Initially Aaron figured on small runs of his new D3 hitch, not sure that Andrews ‘droves’ would mob him for his product or shy away for reasons unknown. Aarons biggest problem now is that his ‘small runs’ are forever ‘selling out’, so he’s upped the anti with larger batches to cater for not only Australian sales, but to the ever-growing overseas requests for his product – Andrew new better after all eh! Aaron hasn't just stopped at having a few pieces of steel welded together, he’s gone the whole hog to ensure his D3 Hi Rise tow hitch is engineer certified, complies with all Australian standards and tells us it overcomes all the OE hitch problems in that it doesn’t inhibit departure angles, you can easily remove the D3 spare wheel without having to remove his hitch, allows most off road trailers, caravans and anything else you may tow to be done at a level stance and can be used as a recovery point. At first Aaron was manufacturing his hitches utilising a self-made jig – all good to a point, but to ensure on-going accuracy he purchased the rear chassis section of a Discovery 3 to double as his jig. Now, every unit is precision laser cut, mounted into the chassis/jig, mig welded, followed by zinc coating, etch priming and painted in satin black or optional powder coated and colour coded. One design area that did need plenty of lateral thinking on Aaron’s part was the 2-part taper-lock nylon bush with internal steel crush tube that comprises the third of the easy 3-bolt fitting procedure. This taper lock ensures a perfect, rattle-free fit into the D3 chassis, while the crush tube prevents over tightening and internal bush damage from the high tensile bolt’s thread. Once fitted, you’ll still need to purchase a tongue and ball (or other off road attachment) to suit the height of whatever it is you may be towing. The Hi Rise hitch accepts standard 50mm square bar and is rated at 3500 kg towing capacity and a 350kg down load. 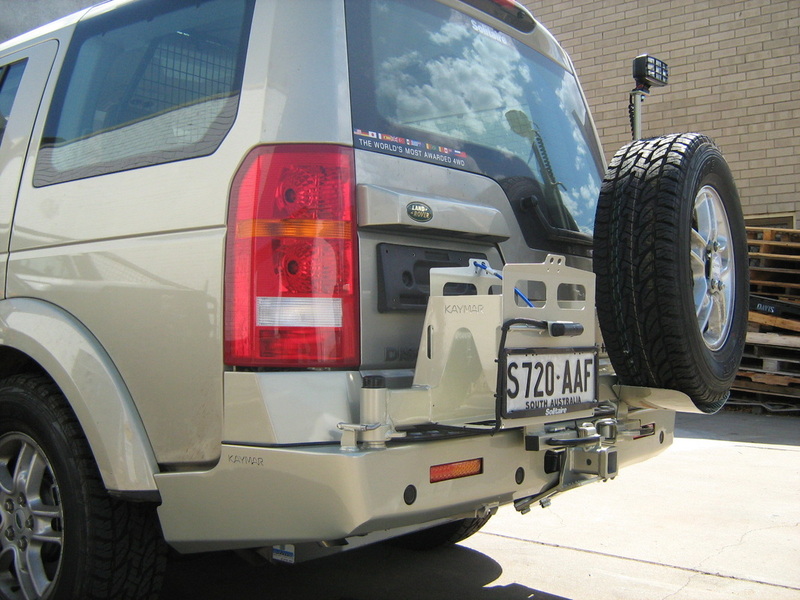 Kaymar 4WD Accessories, one of the big Australian players in manufacturing rear bars, wheel carries and accessories, wanted to incorporate Aarons hitch into their D3 rear bar work. All great, except the high mounted recovery eye was found to foul on the over centre latches of the Kaymar bar. Easy fixed, Aaron removed the offending eye, Kaymar slightly altered their design to perfectly mate the two products together and hey presto, now we can replace the OE plastic rear bumper bar with a heavy duty rear bar, complete with swing out wheel carries, jerry can holders, light holders and of course the Mitchell Brothers Hi Rise tow hitch. With the aforementioned design changes, recovery is now through the hitch receiver, via the hitch pin or a purpose built (slide in) recovery shackle. The ‘pull point’ is inline with the OE recovery point so is sure to be adequate for recovery situations. The D3 drop-down tailgate does not hit the hitch, so no worries about dented panel work. Along with the changes, the Hi Rise D3 hitch also fits directly to the Range Rover Sport, but alas not to standard run-of-the-mill Rangies as their tow hitches are of a totally different design. As the D3 has built-in reversing sensors, the new hitch does interfere with it’s all-seeing, oval shape conical beam. The easy fix is to slightly rotate the two sensors (one either side of the hitch) so as they don’t ‘think’ that an obstacle is in the way. When adjusted, the sensors are said to still be effective in keeping the driver informed of potentially damaging objects behind the vehicle. Aaron is please to say he has had no issues with his hitch and all positive feedback from happy customers. The Hi Rise D3 tow hitch is available direct from Mitchell Brothers 4x4 by phoning (02) 9905 4764, by dropping in to 14 Roger Street Brookvale, or through their web site at www.mitchellbros.com.au.